You can start your child down the road to a beautiful smile early with orthodontics from South Shore Dental Care. Orthodontics don’t just help shape a smile for aesthetic reasons, though. Bite problems, also referred to as malocclusions, can cause all kinds of issues with jaw health as well. 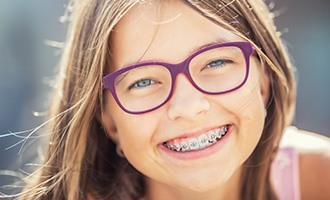 If your child has problems with his or her bite or crooked teeth, allow us to take great care of them with braces. Your child might not be excited about needing to wear braces, but this orthodontic option is still the most reliable and effective method available today for straightening teeth and improving your loved one’s quality of life in the process. Metallic wires attached across brackets with elastics will gradually exert pressure on the teeth so that they shift towards their desired positioning. Better yet, the elastics come in a lot of fun colors so that children can use them to express their personality, and more subtle, tooth-colored options are available as well. If maintaining a natural appearance is a priority for you when pursuing orthodontic treatment, Invisalign could be the right choice. Invisalign does away with the traditional bracket-and-wire model and uses clear, custom-made plastic aligners instead. Each aligner you’re provided with will represent a different stage of your smile journey as teeth are slowly shifted and should be worn for a couple of weeks each. The aligners are comfortable, subtle, and easily removable. Whether you’re looking for orthodontic care for yourself or your child, we’ll have everything you need to get a beautifully straight smile. To schedule a consultation, simply contact us today.